At Solvay, we care about performing strongly on both financial and extra-financial indexes. Positive ratings help us create a long-term trusting relationship with our stakeholders, and the feedback from the agencies has a real impact on the Group’s priorities, as it connects directly with our stakeholders’ key concerns. Solvay ranks Gold, with a score of 80/100 and is in the top 1% of companies rated by EcoVadis in the manufacture of basic chemicals, fertilizers and nitrogen compounds, plastics and synthetic rubber in industry. FTSE Russell1 confirmed that Solvay has been independently assessed according to the FTSE4Good criteria, and has satisfied the requirements to become a constituent of the FTSE4Good Index Series. Solvay is rated as a “Prime Company” with a score of B, by the German Ethical Ratings Agency, ranking among the leaders in chemicals. In 2018, Solvay received a rating of AAA (on a scale of AAA-CCC) in the MSCI ESG Ratings assessment. Solvay was rated “D” in the CDP climate change questionnaire and “C” in the water security and forests questionnaires. Solvay has been a constituent of Ethibel Sustainability Index (ESI) Excellence in Europe since September, 2017. Solvay is confirmed as a component of the DJSI World index. It performs particularly strongly in customer relationship management, innovation management, social and environmental reporting and operational eco-efficiency, while areas for improvement include Genetically Modified Organisms, product stewardship, water related risks and tax strategy. Solvay is a constituent of the Euronext Vigeo 120 World Index. Its performance is considered to be strong and stable. Solvay is rated by MSCI ESG, Sustainalytics, Oekom Research, CDP, Ecovadis, Vigeo Eiris, FTSE Russel, and RobecoSAM (DJSI). From 2019 on, we will focus on agencies for which we have evidence of interest from our investors, suppliers and customers. We will also favor transparent and meaningful methodology and feedback, helping us to improve on the most material aspects, and which rely on publicly available information rather than generating a significant additional reporting workload. We will no longer actively participate in RobecoSAM’s DJSI assessment. 2 An international organization, CDP analyzes how companies integrate climate change in their strategies. 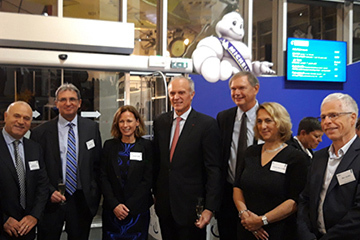 Solvay has won the Michelin Supplier Award 2018 for supplier excellence in quality, innovation and corporate social responsibility, illustrating the strong partnership between the two groups. Solvay, which manufactures and supplies highly dispersible silica for energy saving tires, was selected from 40,000 companies worldwide. The Group received the Award from Jean-Dominique Sénard, Michelin’s CEO. It recognizes suppliers that are exemplary in meeting Michelin’s high standards and in their commitment to building a genuine partnership.